When I read The Vampire Lestat for the very first time, I was in college. A friend had lent it to me after I raved and raved about Interview with a Vampire. He suggested that my ecstasy at the first book would pale next to the divine sequel, something I had rarely come across. Sequels always sucked. I had already learned that the hard way with Love Story and Oliver’s Story (which should never have been written). But he was a trusted book friend (yes, I had those—friends whose taste I relied upon for good books, but with whom I had little else in common), and I decided to bite the bullet and settled in for a long night of reading. I popped in Tracy Chapman’s self-titled album and curled up on my bed. I read it in one go. Every time I hear the song ‘If Not Now’, I remember the warmth of my bed, and the soft swish of water (we lived by the sea back then) through the night. It reminds me of a simpler time, a different time, and even as I am lost in the book itself, it stands as a window into memories of crazy days in college when the world was my oyster and I a shining pearl. Stories can do that for me. They are, in so many ways, my comfort food. Some books have the ability to create long-lasting affinities with their readers, the kind of kinship that brings you back to the story, to the flow of words, to the feelings they evoke because you want to recapture the purity of reading it that first time. They may not be great literary works, but sometimes they offer you the same emotional response that many get from comfort food—satisfaction and happiness. I have a lot of these foods lying about. My reading has slowed down over the years as responsibilities have taken over, but as a child and teenager and young adult, I was going through books like a termite going through a wood-paneled room. Back then, I either bought the books or borrowed them, but if I really loved a book, I would buy it anyway. So now, I have a collection that my husband keeps telling me to cut down on, but I can’t, because they’re not just books, they’re memories. When I first came to Pakistan, a final move in my adolescence, I was reading Nancy Drew and the Hardy Boys. I barely remember the stories now, but I keep the books because they remind me of airports. I was reading a Nancy Drew story during a layover in Frankfurt when a couple scared the living daylights out of my little sister. They had a dog in their carry-on (yes, in their hand luggage, a delightful little puppy), who barked at her when she tried to pet it. She hasn’t let it scar her, but the ruckus caused a bit of a stir in the airport. I don’t remember whether they managed to smuggle the dog on board after we had exposed them, but I don’t think it was such a big deal back then to travel with pets. I was reading Black Beauty when I went for my first entrance exam for schools in Karachi. I remember writing an essay about a horse (though I remember little else from that day). When I went on my first date, I recall raving about Tolkien to the boy (who’s insignificant to the memory) and insisting that he read The Hobbit. I don’t think we went on a second date (in any case, the logistics of hiding the dates from my parents were so traumatic, it wasn’t until college that I managed to go on a real date and more than once with the same boy). The books of my childhood are markers for how I grew up. I don’t read them that often any more, but they do evoke powerful emotions for me. This morning, I woke to find three reviews of my book, Butterfly Season, by three random, unconnected readers—a reader who stumbled upon the book and loved it, a reviewer who runs a book review blog, and a professional critic for a Pakistani magazine. I had sent the book to the reviewers, but the reader was a lovely surprise for me. The critic, however, didn’t like the book, and her review sparked a memory in my brain. I went looking through my library (a euphemism, really, for the shelves up in the hallway) for Rest and Be Thankful, an old favorite of mine. The book is by an espionage writer, Helen MacInnes, though the story is not a spy thriller. It’s a lovely tale about two women who take a wrong turn while travelling in Wyoming and ending up at a gorgeous ranch house called ‘Rest and Be Thankful’. It’s a story of city folk comprising of book critics and aspiring writers descending upon this little oasis in the mountains and turning up their well-read noses at the earthiness of the ranchers. It’s about the pretentiousness of the New York literary scene in the forties, and of how disconnected it was to the realities of everyday life in America. I can’t help but relate the priggishness of those city slickers with the literary critics in Pakistan. They’re a tight-knit little bunch here—writers and critics who turn up their noses at ‘popular fiction’ and I suppose I shouldn’t be surprised that a romance novella didn’t make the cut. As I write this post, Rest and Be Thankful is sitting peacefully on my bedside table, waiting to be re-read. It’s my comfort food right now, because there’s a neat little twist to the story (and with apologies for the spoiler)—the small bunch of city slickers spending their summer at Rest and Be Thankful are there courtesy of a woman whose wealth came almost entirely from writing popular romance novels. That makes me smile every time I read the book. Because my comfort foods are not literary classics. They’re all popular stories of their day, and would have been rejected out of hand for their popularity by the critics of their time. 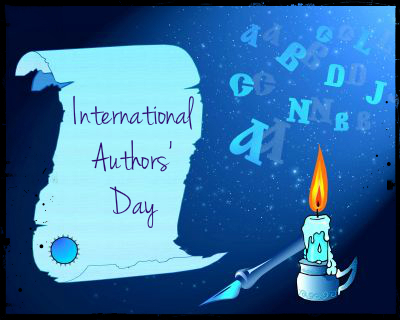 This post is part of a blog hop by b00kr3vi3ws.in, who are celebrating (along with the rest of us) International Author’s Day on July 18th. You can click on the link below to get a list of (and links to) all the participating blogs. I am also supposed to run a giveaway, but since my book is already part of the Tornado Giveaway, I redirect you there instead. Thank You for joining in the #IAD Celebrations! Lovely post. You have dusted off/highlighted my need to re-read some of the books that I devoured by candle light under the covers as a child/young adult/student. Like you, Nancy Drew featured heavily as did anything by Enid Blyton. As a pre-teen in the 80s, I was addicted to the “point horror” series. I suspect these were awful, but they were brilliant at the time! I found you on #mondayblogs. Welcome to Dear Rumi, Glasgowdragonfly. Thank you for the retweet on Monday Blogs (what a fantastic platform!) as well. I have tons of Enid Blyton’s Famous Five stories. I’ve never heard of the ‘point horror’ stories, though I do remember a number of random books I borrowed from our local library – horror, sci-fi, fantasy – whose names and authors I have no recollection of. Great post! And I know it’s easier said than done (in fact I know it’s nearly impossible, but we have to do it anyway) – but take a deep breath and step over the negative review. You can’t please everyone. Thank you for the kind words, Linda. I’m drowning my sorrows in the book for now. I have so many lovely markers around reading books with my children – picture books like Goodnight Moon and Where the Wild Things Are, to Easy Readers like Little Bear and Frog and Toad (such a delight when books are easy for children but remain entertaining for adults) to “chapter books” and series like the Boxcar Children, and Swallows and Amazons. When they started devouring books by themselves and schedules got complicated with activities, reading together at bedtime gradually disappeared. But I missed it for a long time. There are markers for my own years, too, but somehow watching them grow and watching their reading grow are most on my mind tonight. Great post!!! Reading really can feel like comfort food 🙂 Happy IAD!! !